We spent a few days at the end of this summer putting up a reclaimed barn at the back of my property for my daughter and her husband. We enjoyed beautiful late summer days and with a small crew of 7 people, we were able to re-erect the restored barn in a day. It’s nice to be able to use my skill to help my family out – and of course there is nothing like having my grown kids nearby! On this project, I was also able to use some of the leftover timber and reclaimed wood from other projects. A great recycling project all and all, and one that makes for an eclectic, one-of-a-kind, beauty of a barn. This barn comes from a two part structure from a farm in New York state. The oldest section was from the 1840s and has been sold to a customer. The barn in this blog was probably added on to the 1840 barn in the 1900s and was not finished with traditional joinery. 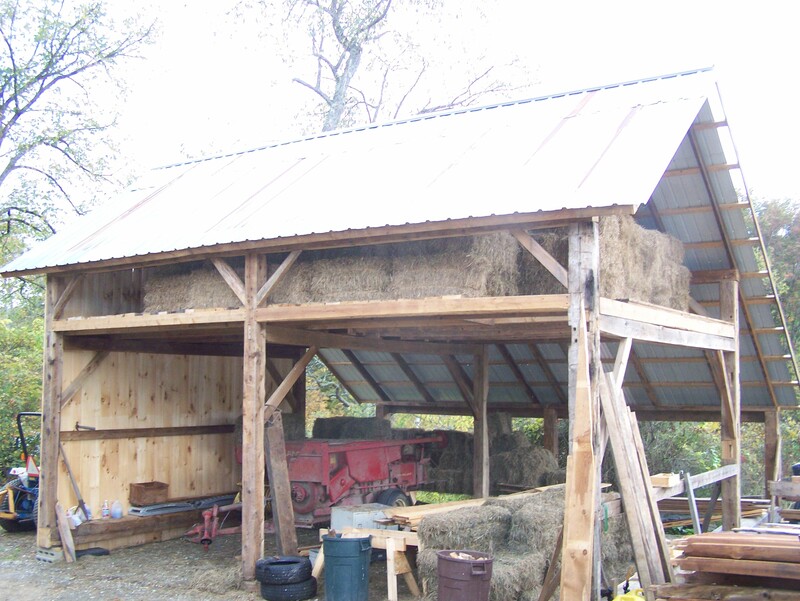 As a historic piece it has little value, but the timbers are strong and sturdy and I knew it would make a fine shelter for the kids’ farm equipment and hay. The original barn under black plastic, circa 1840s. Addition probably 1900, being dismantled. 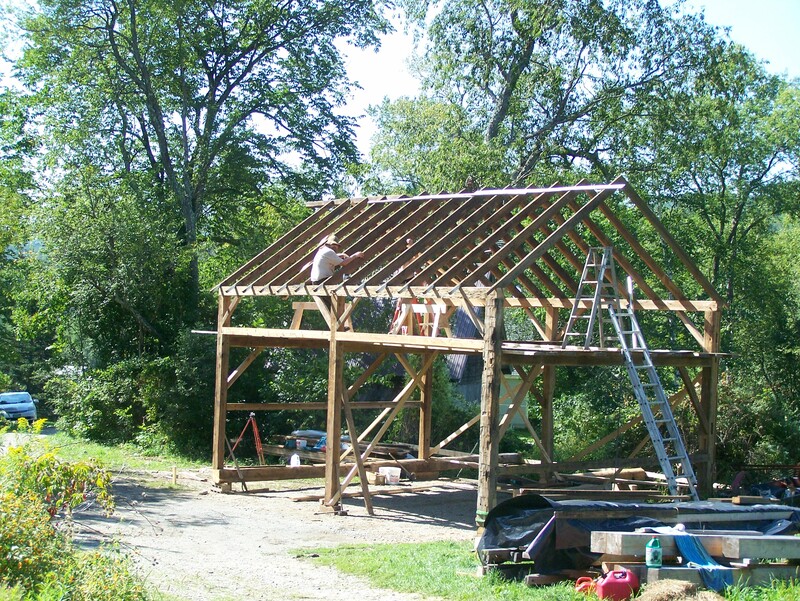 We dismantled the newer barn first and restored it with traditional joinery. (That means that we let in the bracing and tie timbers with mortise and tenon joinery, instead of just nailing things together.) While this takes a bit more time than using a hammer and nails, it gives the barn a much more authentic, historical and structural look. Here we are putting up a bent (or side wall). 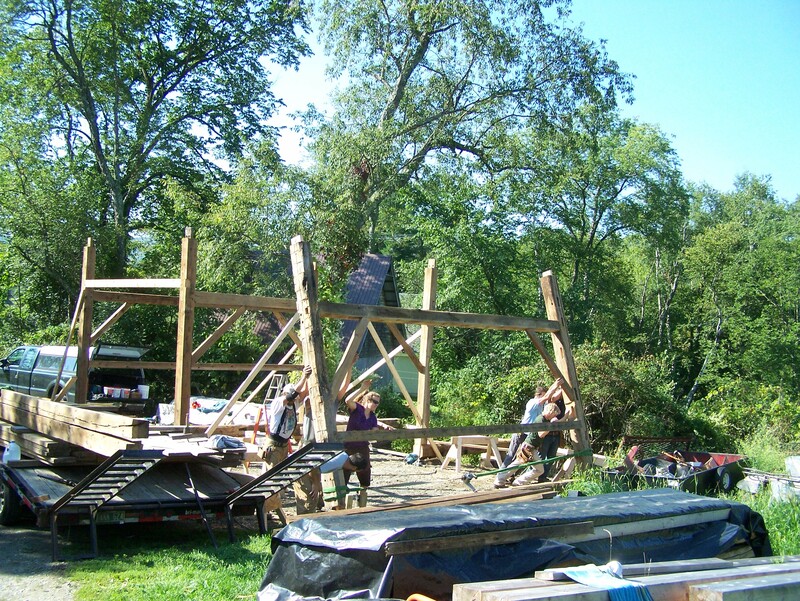 Here the 2×4 roof purlins are being applied. The recycled metal roof was screwed to the 2x4s. The next step was to build a second floor which you can see (from below) in the next picture. We used a mixture of common 2x6s doubled up and half round timbers to create the floor joist system. The flooring is 2 inch planking. We’ve started the siding by using some newer recycled boards. We will have to cut three feet off the top to find the second floor, but it is doing the job for now. The remainder will be finished with older boards. We will also be attaching a shed roof to this wall in time. 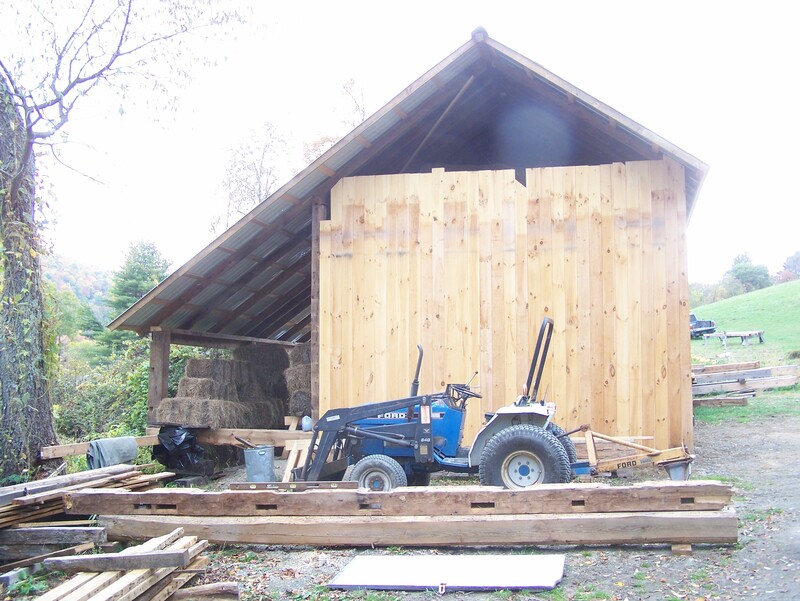 In the picture above, notice the future shed wall sill and top plate timbers in front of the tractor. 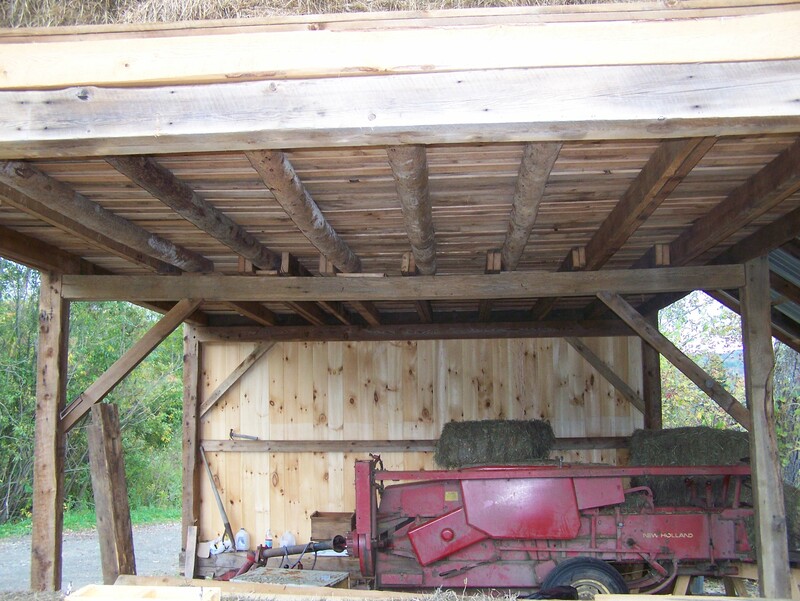 The ground level of the barn is for storing mowing equipment while the second floor is for storing hay. As you can see below – it’s already in use! 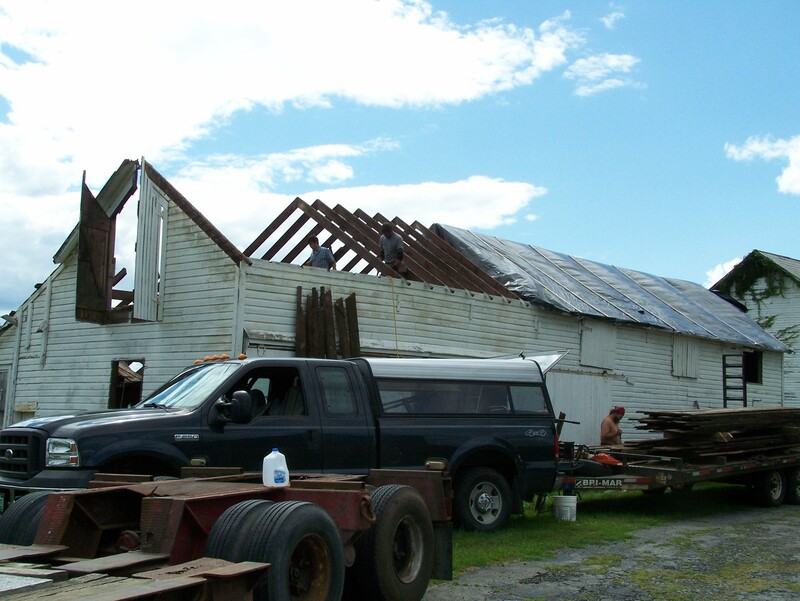 While the barn is highly functional and my son-in-law is pleased, this barn is still a work in progress. As we gather more siding from other jobs, we plan to wrap the frame entirely with siding that doesn’t make the grade for our paying customers. Here’s how the frame looks today. We should have all the siding on by Thanksgiving. 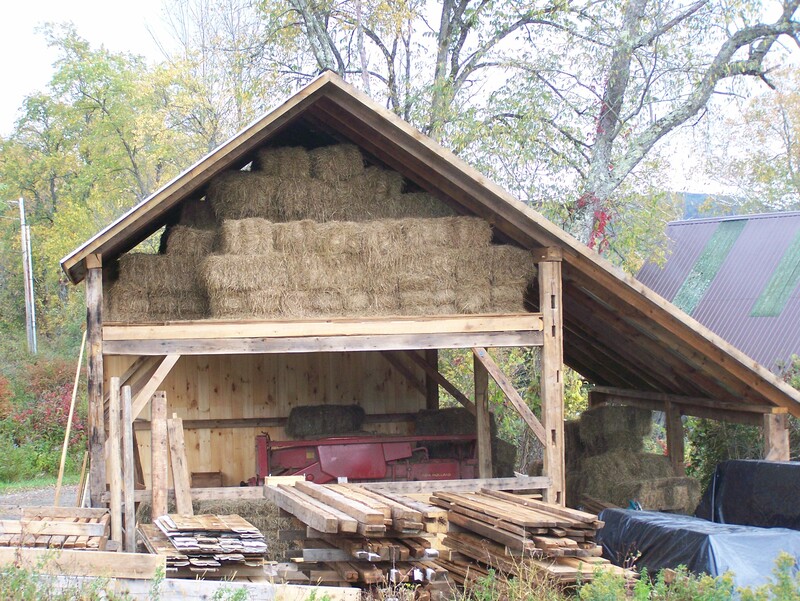 Interested in having your own barn home or backyard barn? Let us know! 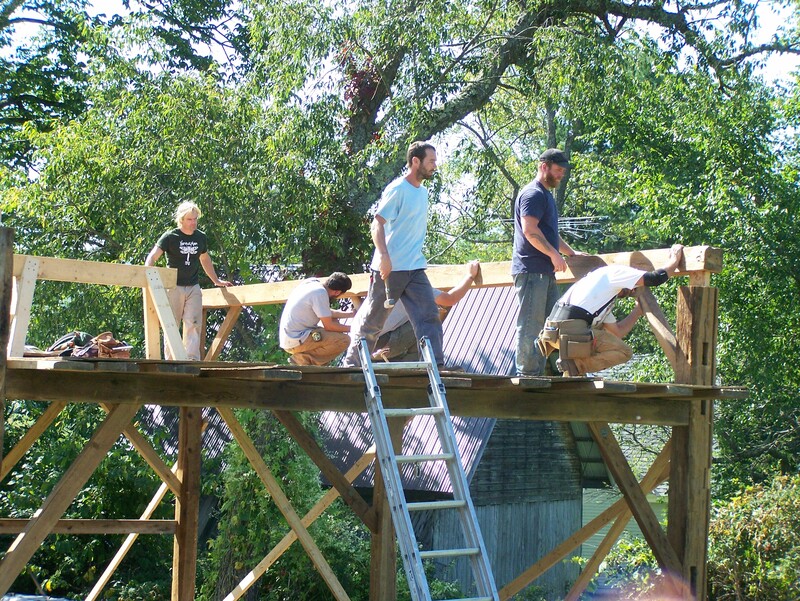 This entry was posted in Barn Raising, Green Mountain Timber Frames, Middletown Springs, Post and Beam, Timber Frame Projects, Vermont and tagged American heritage, barn frames, barn raising, barn restoration, colonial america, Green Mountain Timber Frames, old barn, old barns, old barns vermont, reclaimed wood, restored wood, timber frame joinery, timber frames Vermont, timber framing, vermont timberframes by Green Mountain Timber Frames. Bookmark the permalink.